The latest version: 1.3. Click the Download button below if you wish to try it. 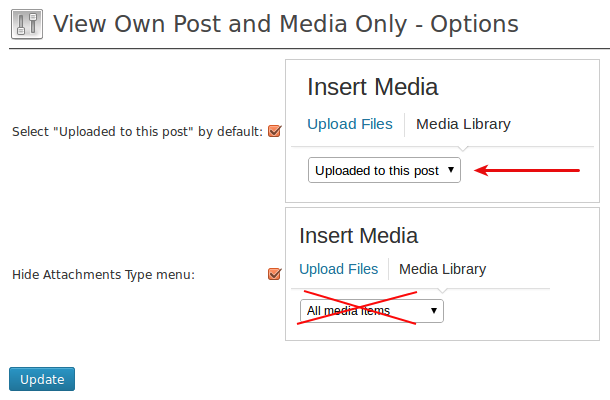 As additional options plugin may automatically select “Uploaded to this post” item from drop-down list at Insert Media – Media Library dialog and hide this drop-down menu for all users except Administrator and Editor, or other words user with ‘edit_other_posts’ capability. – Main part of the code is taken from StackExchange. Thanks to Paul for ideas and code samples. – designlabcph – thanks for ideas and help with code snippets searching. From the begin I plan to make plugin work in silence, without any options. 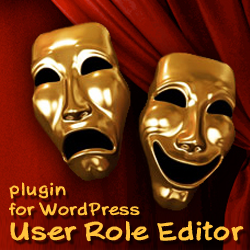 After this discussion plugin got additional functionality and options page was appeared. Restriction applied to the selected admin pages only (Posts and Media Library) to exclude compatibility issues with other plugins. CSS updated for WordPress 4.0. Added option to turn on/off ability to hide comments to the posts of other authors. Admin sees all comments now. Added option to exclude from plugin action selected custom post type. If you use plugin “Contact Form 7”, do not forget to exclude its ‘wpcf7_contact_form’ post type from this plugin action. Support for ‘supress_filters’ query variable is added. If you need to make a query without it being filtered by “View Own Post Media Only”, use $wp_query->set (“suppress_filters”, true); at your plugin or theme. If you have any feedback about this plugin, you are welcome! 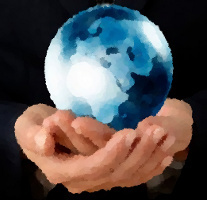 This entry was posted on Saturday, January 5th, 2013 at 11:14	and is filed under ShinePHP WordPress Plugins, WordPress. You can follow any responses to this entry through the RSS 2.0 feed. You can skip to the end and leave a response. Pinging is currently not allowed.